Today wasn't anyone's birthday, but Blake celebrated his a couple weeks back. Next week Kevin (my baby!) will turn 9 (!?!?!?!). I wanted to share the card I made for Blake's birthday. I used scraps from a Scarlet Lime Frugal Fab kit. I pieced the kite together and adhered it with pop dots. (They seem to be my go-to item!) It still doesn't seem possible that Blake is 12! I also recently scrapped a birthday layout. The photos are from Blake's 11th birthday though. I scraplifted a Kelly Goree layout in the new issue of Scrapbooks Etc. I was able to use my new papers from Imaginisce. I've wanted these birthday papers for SO LONG! The layout is for Kevin's album. I am so blessed to have these two wonderful boys. Gorgeous work my friend...but then again that is always true of you. Awesome birthday LO's! I love the paper line you used! 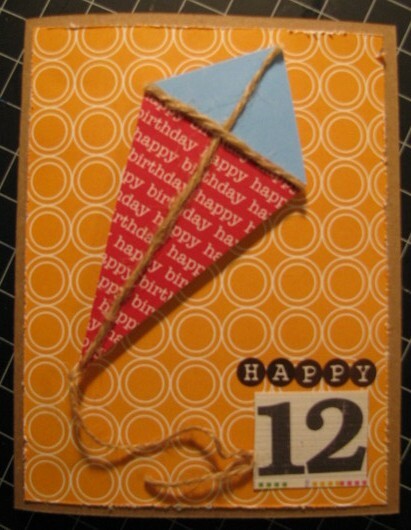 You are blessed to have two wonderful boys :) Love your kite card and the layout is really fun. That Imaginesce line looks like a "must-have".